In August 2008, the Lord blessed us with a brand new cabin - RomantiCabin. 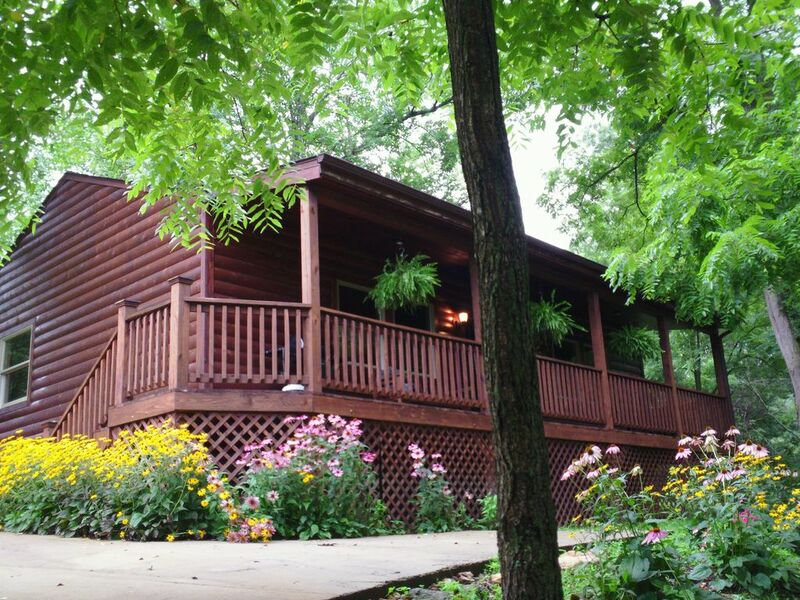 Designed for honeymoons, anniversaries, or just a getaway in the Smokies, this cozy cabin is a great vacation spot. It's surrounded by natural beauty and only a short drive to so many great places to enjoy! Inside, you'll find beautifully designed vaulted ceilings, hardwood floors and wood furnishings! A romantic gas log fireplace and cozy couch makes it perfect for a romantic getaway. You can have fun indoors with the Brunswick regulation-size pool table and the 42' High Definition TV! It even has a complete surround sound system, satellite, and great movie library! Free WiFi is also included! Adjoining the great room is a full kitchen for your dine-in convenience! The bedroom is full of charm, with a king-size, four-poster, pillow-top bed and beautiful adjoining tile bathroom! The vaulted ceilings continue into the bedroom/bathroom where there is a 10-jet, two-person tub and a separate 5x5 ft. shower with 10in rain head! The area around the cabin is full of things to do! Maggie Valley, Waynesville, Lake Junaluska, Dillsboro, Biltmore, Asheville and Cherokee are just a few of the surrounding towns of interest! Gatlingburg and Pigeon Forge are about an hour away! Enjoy the scenery, gardens, hiking, biking, restaurants, museums, skiing, horseback riding, and much more! RomantiCabin is located 25 miles west of Biltmore, 45 miles from Cherokee, 10 miles from Waynesville, 15 miles from Maggie Valley, and just 3 miles from I-40. Listen to the creek from the front porch. This cabin is luxurious, yet cozy, and tucked away in a mountain valley with gurgling river at the foot of the hill. It is a short way north of I-40 and about a 30-minute drive west of Asheville. The owners live at the top of the hill one hundred meters above the cabin and are extremely accommodating to any requests. The cabin is solidly built and warms quickly when the gas fireplace is lit. A large living/dining/kitchen area boasts a Brunswick pool table and Dish satellite television. The bedroom hosts a comfortable king-size bed, spacious two-person jacuzzi tub, dresser/mirror, closet, bathroom and a soothing 25-square foot shower with rain shower head. The front verandah is home to two rocking chairs, a bench and large gas BBQ grill. The kitchen includes Whirlpool appliances - oven/range, dishwasher, microwave and side-by-side refrigerator. All-in-all, this is the finest cabin we have rented in the mountains of North Carolina and we hope to repeat our stay there in the future. Just a word of advice: the kitchen has all the utensils, dishes and pots you will need, but bring spices, plastic and aluminum wrap with you. An excellent Ingles grocery is located about 9 miles away in Clyde. In addition, a cardinal taps the bathroom window every morning (seeing his reflection?) to help you awake. He also fights his reflection in your vehicle wing mirrors, so expect to clean the car doors every day! A few bread crumbs on the verandah top rail are quickly disposed by the sparrows and tufted titmouse that inhabit the nearby trees. This cabin was everything we needed for a quiet cozy getaway! Beautiful interior with a huge tub and shower in the bedroom. We fly fished at the creek and enjoyed all the birds. Everything was effortless. Can’t thank you enough for allowing us to stay in this wonderful cabin. We will definitely be back! Great space, incredibly clean, very peaceful! Very cute, clean, comfortable space to stay when in the area. Beautiful drives and landscape in all directions, but relatively close to civilization. Will look to stay here again if I’m the area in the future.